Each month in EARTH, we're featuring individuals who inspire us to care for creation. This month, we hear from PEC's Steering Committee At-Large Representative. Dave is a member of Western Boulevard Presbyterian Church in N.C. and a student at Duke’s Nicholas School of the Environment and Divinity School. Dave writes a blog as “a bridge between the academic study of ecology and theology and communities of faith so that students, practitioners, and people of faith increasingly recognize shared ground and opportunities for contributing to the common good of the environment.” He organizes the Youth Faith Conservation Network (YFCN), made up of “high school youth of faith communities enacting sustainable habitat and energy projects within faith communities.” It is a partnership between NC Interfaith Power and Light and New Hope Audubon Society and supported by Toyota TogetherGreen. The YFCN was launched by inviting youth to an ice-cream party to explore how to connect faith with environmental restoration through hands-on conservation. As students developed ideas, they were provided with: a peer network; fundraising opportunities; mentors from 1. their congregation and 2. the community (in energy, ecology, and information science/technology); and training (Brown-headed Nuthatch conservation, landscaping with native plants for wildlife habitat, and utilizing social media and art for conservation). They participated in “Witnessing Best Practices in Habitat and Energy: A Tour of Raleigh Faith Communities via Biodiesel Bus,” including an example of wetlands restoration. 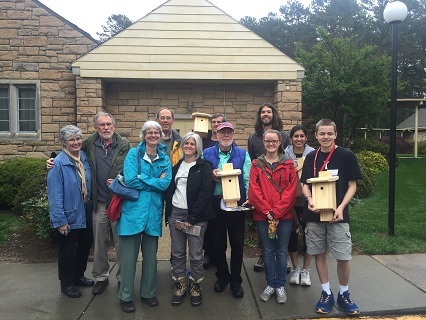 Four youth projects resulted: 1. purchase and distribution of 50 Nuthatch birdhouses, 2. rain garden/native landscaping for wildlife on church grounds, 3. writing a church curriculum resource on wildlife conservation, and 4. promotion of solar panel installation. For more information about Dave’s work, feel free to contact him at david.grace@duke.eduand read at http://blogs.nicholas.duke.edu/author/davegrace/.